Hotel Re di Roma is a modern three-star hotel in a residential and commercial area just outside the heart of Rome, close to a Metro station. 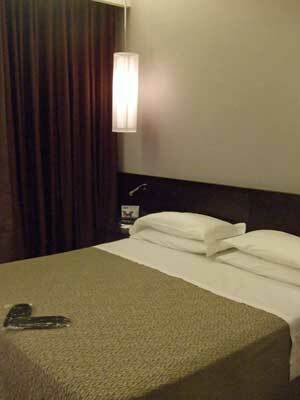 It has comfortable modern rooms and helpful staff. Although room-prices vary, the hotel generally offers good value for money. I booked a double room at the Hotel Re di Roma for two nights in March 2009. It was a short-notice booking, for Thursday and Friday nights. I paid €99 per night, which was quite good value - though if I had stayed for Saturday night, the rate would have increased to €149. The location, in the busy San Giovanni neighbourhood, by Piazza Re di Roma, is outside the historic centre so it needs good room-rates to make it a competitive option. The hotel had good reviews from past guests, and having lived just five minutes away, I was curious to see the hotel. I had forgotten the traffic around Piazza Re di Roma, which is basically a little dusty park in the centre of a frantic roundabout. 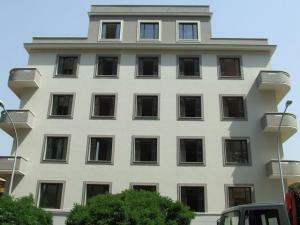 Luckily, one of the exits from the Re di Roma Metro station is conveniently close to the hotel on Via Vercelli. The hotel building is large and modern - fairly typical for the area - with a low-key entrance. A curved ramp for suitcases and wheelchairs made a good impression, as did the friendly receptionist. After checking me in, he showed me to my room personally and explained how everything worked. 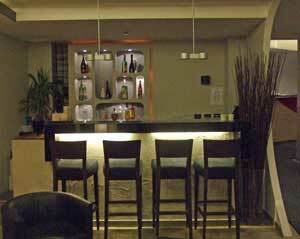 All the reception staff I encountered spoke good English and were extremely pleasant and helpful. The obliging personal service did, though, mean that there was sometimes a wait for attention at the desk. My bedroom was a reasonable size, though without space to accommodate much more than a double bed. The style was modern and smart, and the furniture was decent. The bed was firm and comfortable, with good pillows and the option of spare blankets. There was a convenient small writing desk with a power point and cable connection for a laptop, though it was a pity the hotel had only squeezed in a soft cube seat, rather than a proper chair. Other furnishings included a full-length mirror, a wall-mounted flat-screen tv with Sky channels including several in English, a wardrobe and safe, a mini-bar and a chest of drawers. Into the long wooden bed headboard there were mounted two bedside tables, with little arrays of complimentary items: notepads, pens, tissues and wipes. The hotel also proviced free slippers (useful on the wood and stone floors), and a small clutch of toiletries. I liked the little bottles of shower/hair gel which fitted together with the unusual extra of conditioner. I would have appreciated a hook to hang my coat on, since there wasn't even a chair-back to utilise. The general impression I got was that the hotel had been planned with thought, but that occasionally it had been down by poor finishing. A hole cut in the bathroom tiles for some drainage device had not been covered over, and although the bathroom fittings were good quality, the toilet flush didn't work - on reporting to reception I was told to use a second button on an adjacent wall. I assume this lower-level flush control was due to the fact that the bathroom appeared to have been designed for disabled people. The disabled-style toilet was extremely uncomfortable. The shower was set in one corner of the floor. It was a good shower but the lack of a rim meant that water flooded over the floor. And the flimsy dark-coloured shower curtain both made the shower corner very gloomy and meant that draughts blew the clingy fabric against one's skin, which wasn't a pleasant or hygenic experience. The bathroom was a very good size, though, and fittings were good quality - it was a shame that these details detracted from its practicality. Despite the comfortable bed and surroundings, I didn't have a good first night. Although there were two doors between me and the corridor, the room wasn't well sound-proofed. There was an unusually loud sound of runnning water from other bathrooms (I was on the first floor, so the majority of rooms were above mine). I was disturbed around seven by an Italian woman ranting, presumably at her husband. Shouting so clearly I could hear every word in my room, she provided a bad start to my day. The ground-floor breakfast room was a pleasant space. The buffet was very Italian; reasonable but not particularly generous. Instead of drinks being brought by the friendly waitresses, guests helped themselves from a machine. Not ideal if you wanted to fill a teapot, as the hot water wasn't boiling or provided in large enough doses. Milk, from a flask, had to be carried to the table in a beaker. Cold drinks on offer were fruit juice (sugary) and mineral water. Laid out on the buffet table were a few types of cereal, rather doughy croissants, fresh fruit, tinned fruit salad, cold meat and cheese (not separated for vegetarians). There were the cold dried toast slices Italians seem to like, and some small unsalted dough creations, but no normal bread rolls. I wouldn't say it was a bad breakfast by Italian standards, but it could have been better. The hotel offered free wireless internet, but the coverage was not complete when I visited. In my first-floor room the signal was weak and the connection slow. Down in the public lounge on the ground floor it was very efficient and fast. 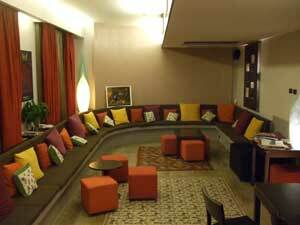 This lounge was a large space with lots of seating and a table which I found a useful place to work. Alongside was a smart little bar. There was a computer terminal giving guests access to the internet. Like the rest of the hotel, these public rooms were modern in style, and they'd been furnished with taste. I thought the hotel was efficient and had made a real effort with customer service and facilities. The sound from other rooms was a serious problem, though. Waking at seven in the morning to hear strangers arguing is not conducive to a comfortable stay. To judge by other guests' comments, it seems that only some rooms have this problem (and not all fellow-guests will be as loud). Again, my bathroom was uncomfortable, but I suspect that fittings may vary from room to room (mine was room 101). I'd recommend the hotel as a practical place to stay if the prices for your dates are competitive and you don't mind being some distance from the charming and central parts of town. Personally, although it was good value for my travel dates, I wouldn't pay a lot to stay here as although there is nothing really wrong with the location, I prefer historic surroundings and to be within walking distance of the sights. However, the modern feel, which is rare in Rome, will compensate some travellers for any inconvenience, and you do get a taste of real Rome when you stay here. Although I have made some criticisms, my overall impression was positive and readers should bear in mind that this is only a three-star hotel and it is good for its category. Hotel address: Via Vercelli, 21. From the underground Metro station Re di Roma (four stops from Stazione Termini on Linea A), look for the exit (on your right) labelled Via Vercelli and follow the indicated passages and steps until you ascend to the street. The hotel is on the left hand side of the street as you walk away from the busy roundabout/piazza of Re di Roma - it's not very noticeable; look for the building with curved balconies and red ground-floor window frames. This is still a central area of Rome, but it is just outside the Aurelian walls which circled the historic city, and it is - unless you're feeling energetic - a bus or Metro ride from the main sights. When I lived nearby I used to walk past the Basilica of San Giovanni and down the hill towards the Colosseum, which is quite an interesting walk. The immediate vicinity of the hotel is respectable but not appealing: wide busy streets and scary pedestrian zebra crossings (the trick is to keep an eye on the traffic and just start walking confidently). There are lots of shops and businesses here, with residents living on the upper floors of the tall buildings. Around evening passeggiata time the pavements are crowded; at night when shops are shuttered there are few pedestrians; just passing cars, though the streets are still safe. There is a very popular gelateria (Le Procope) in Piazza Re di Roma and famously-good tiramisu available to take away from a bar called Pompi on Via Albalonga. For dining locally, I'd recommend Al Vecchio Lotto on Via Veio (about 10 minutes' walk away), a cosy Neapolitan restaurant. For something efficient, affordable and family-friendly, try the chain restaurant Pastarito, which has a branch just past San Giovanni in Via Emanuele Filiberto and another at Via Tuscolana 226. The hotel's reception staff had a few other restaurant suggestions. Hotel Re di Roma review by Italy Heaven editor.